I weighed myself this morning and I lost 4 pounds over the past 24 hours. Back below the 130 mark. That part of my Emotional Mind feels relief. I’m about mad and frustrated though that this is the way things are…that I have to smoke again to get my body working again…that smoking does this for me and my body is addicted to the cigarettes. I’ve smoked and quit smoking probably 20 times in my life with about 6 times being over the last 5 months…I’ve never had this kind of problem before when I’ve quit smoking. My body has never reacted like this. For me, quitting smoking has always been a choice…a decision. I would decide to quit and I quit…and that was that. I was fine. It was a no big deal type of thing. It was a decision. Today, it’s not just a decision. It’s not so easy. I’m having big major problems quitting. My body is addicted and it’s causing me big major problems. That makes me angry / frustrated because I want to be in control of my body and my life. I want to be able to make decisions about my behavior…and to be able to change my behavior without all these problems. I want to decide to do something…and then it happens. I did quit smoking for 10 days because I set my mind to it…but then, something happened. The something that happened is that a big boulder fell out of the sky and slammed right into the middle of my recovery path. That something was the bloating, constipation, and subsequent MASSIVE weight gain. My reality changed. Things aren’t the same as they used to be. I have something new to deal with. That reality is that I’m not 16 or 25 or 35 anymore. I’m getting older and my body is changing. Things aren’t the same as they were before when I’ve successfully quit smoking…and my task in life right now is to adjust and deal with my new reality. My reality is…my body is having a major GI (gastrointestinal) response to withdrawal from cigarettes. My body is reacting in a big way. My reality is that to be successful with quitting smoking, I am going to have to find a way around, over, through, or passed this big obstacle in my recovery path. I am going to have to find a way to deal with it. A bit of history. I have lost 145 pounds over the last 4 years. I was never FAT until I got FAT at about the age of 29. I was usually in the 115 to 135 range…but then, marriage to a man that eats, children, and a job AND a business away from home that created a chaotic out-of-control eating lifestyle…led me to gain a pound or so a month…over many months…to become VERY overweight. This is another story and over time, I’ll blog about it. But today, I’ve lost a ton of weight…and I am determined NOT to get fat again. I don’t want to go back there again. So, it really alarms me when my weight starts going up and I’m NOT IN CONTROL. Since I quit smoking 10 days ago, my weight went up 7 pounds. The last day before I quit smoking, it jumped two pounds. Rationally, I know it’s not real weight, granted maybe ½ a pound of it is because I was eating a bit more those days. However, I went up two pant sizes and even the bigger size was a little tight. My Emotional Mind was very disturbed. If we can even call it Wise Mind…it kicked in and said smoke again, get your weight back down, and get a new Game Plan. That sounds like a horrible Emotion-Driven Lie I told myself. However, I know me and I know my sense of determination and I can get away with that. I am bound and determined to kick this smoking thing because I don’t want to be 65 and tied to an oxygen tank. I have other plans for my life and it doesn’t include toting around an oxygen tank. I will find a way to make this happen…one way or another…and come hail or high water. I still have some options. I can talk with a doctor and find out if a patch or a pill can ease my physiological withdrawal from cigarettes and can keep my body from reacting so intensely to the lack of whatever poison it is in cigarettes that is causing this bloating, constipation, and major weight gain. I can start exercising regularly to keep my metabolism up and to offset the increase in calories. I can ask my family NOT to bring ANYTHING in the house that will tempt me to eat…to hide it in their room, leave it in the car, but to keep it out of my range of vision. In the last few days, Sour Cream and Onion Lays potato chips came in the house and a box of Reeses’ cereal. Even snacking on those added 300 calories to my day…on Thursday…the day I decided to smoke again. I can also make some calorie / diet changes to what I normally eat on my own and without temptation from others. I can adjust my routine diet. I’m not done yet. I still have some options…and I still have a helluva lot of fight inside me to get past and through this tough time. Come hail or high water and boulders that fall out of the sky, I will make it through…because it is important to me to quit smoking. Do pray for me because I really want this to happen…and I need all the help I can get! 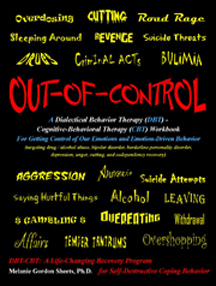 Please visit the website www.dbt-cbt-workbook.com for more information about the DBT-CBT Workbook. The full title is “Out-of-Control: A Dialectical Behavior Therapy (DBT) – Cognitive-Behavioral Therapy (CBT) Workbook for Getting Control of Our Emotions and Emotion-Driven Behavior” – Recovery Works Publications, 2009. Quit Smoking and Bloating, Constipation, Reduced Metabolism, and Weight Gain! The same thing happened again…I got bloated, constipated, and my weight went up. I gained 6 pounds and 2 pant sizes. Not a happy moment. Good-bye slim fit Wrangler size 9 and hello size 11 regular fit! That’s going from a size 7 to a size 11 with just 6 pounds…6 pounds in my stomach and waist area that is! If you read the other blog post I wrote recently about my struggles to quit smoking, you’ll know that I’ve quit smoking 5-6 times this year…and each time I got bloated, gained a bunch of weight REAL FAST…returned to smoking…and lost it all real fast. One time I was eating a lot of nuts and blamed it on the nuts. Another time I blamed it on starting birth control pills. This time, I didn’t change anything in my life…but, the same thing happened. As is typical, I talk to my friends when I’m in distress. Today, I spoke with a friend…and he said the same thing happens to him…the bloat, the constipation, and the weight gain when he quits smoking. I told him another friend told me that smoking increases metabolism…so I assumed not smoking results in decreased metabolism. Well, knowing he’s had the same experience, I googled and read about what happens when you quit smoking. This pattern is typical. It’s not just about eating more, it’s about the GI tract slowing down, constipation and bloating! So, I learned something new today. Well, I started smoking again this morning…because now I have gained 6 pounds and I went up two pant sizes. My plan…get a Game Plan, just like I teach in the DBT-CBT class. Obviously, recovery from smoking is more than just stopping smoking…it’s going to involve some major life changes…some of which I have no interest in changing. I have to decide what to do. I already drink quite a bit of water and I eat a LOT of fiber each day. I guess I have to add regular exercise…URGH! I am also going to visit with the doctor and see if there is a magic pill or patch that will help me transition from smoking to non-smoking without all this bloating, constipation, and weight gain. I can deal with a little weight gain…but not something that makes me feel totally Out-of-Control. So, my plan for now is to smoke for a couple weeks, let my body readjust to all the toxins and poisons in the cigarettes, and…enjoy it as my weight goes back down and I get to smoke again. Then, with increased knowledge and a different plan, I will try again…and I will keep trying until I make it. I sure hope cigarettes don’t kill me in the meantime. One thing I have to think about is that when I stop smoking, my caloric needs will go down by about 150 calories a day because my heart won’t be pumping so fast. My metabolism will go down because I won’t be smoking and causing my heart rate to unnaturally increase. If I’m eating 300-400 extra calories per day because I’m not smoking…then that’s about 500 extra per day…and one extra pound of true fat per week. I am going to have to do something to offset that! It will be hard to reduce caloric intake by 150 calories a day because I normally eat about 1200 calories per day! So, I have a definite problem. Another thing I have to keep in mind is that I lost the first 100 pounds without smoking and I have been slender before without smoking. Somehow I did it then, and I have to do it again. Please visit the website http://www.dbt-cbt-workbook.com for more information about the DBT-CBT Workbook – full title “Out-of-Control: A Dialectical Behavior Therapy (DBT) – Cognitive-Behavioral Therapy (CBT) Workbook for Getting Control of Our Emotions and Emotion-Driven Behavior. This is my 5th or 6th time to quit smoking this year. This is something I’ve always been really good at. I’ve successfully quit smoking over a dozen times in my life. No joke…I really mean it! I’ve quit for long periods of time, like years at a time…and then, I pick up a cigarette…and here I go again! I have most often quit when I’ve gotten sick. It was always a “planned quit”…”I’ll quit next time I get sick and cigarettes taste horrible.” That was a very effective plan. The problem this time…is that I haven’t gotten sick enough to quit and I’ve had to find other reasons to quit. No, please don’t pray for me to get so sick that I quit! Don’t want to go there on purpose…especially in this age of swine flu! I’ve also quit several times due to pregnancy. I’ve also quit before when I dated someone who didn’t smoke…I knew what it was like for a non-smoker to kiss a smoker…been on the receiving end of such a kiss…and it’s plumb nasty! All in all, I’ve smoked and have quit many times over my 40 year smoking career. I was telling a friend about the weight gain…the bloating…and all the concomitant gas. I told her I shouldn’t be gaining weight because I wasn’t eating that much. She asked what I was eating…and I bragged on eating a very healthy diet of nuts. Well, thank goodness she knew a little something about nuts. She told me that nuts cause bloating…and can cause all that extra gas! I told her I sure wanted to get rid of all the bloating but I was rather enjoying having the ammunition to get even with my gassy family. Well, I did a bunch of googling and found out she was right! So, I got off the nuts and took up smoking AGAIN. My weight dropped as quickly as it came on…and I was RELIEVED! My Dad was hospitalized for a stroke on Feb 1st…about 3 weeks into my most recent smoking indulgence period. Baylor Heart Hospital in Dallas is NO SMOKING all over the campus…there are NO smoking places…inside or out…imagine that…a heart hospital that does not support smoking. So, given we were living at the hospital for a week, and given my father was a long time smoker and obviously just had to quit cold turkey, I had to give up smoking AGAIN. That went just fine for a few weeks…and since I wasn’t smoking, I figured it was a good time to start the birth control pills my doctor has prescribed for pre-menopausal hormone replacement. I tried them about two years ago…but my weight went crazy and I quit. Well, this time wasn’t any different…my weight went crazy again. I was gaining 1-2 pounds a day…and about 8 days, 12 pounds, and two sizes later, I quit the pills three days early and started smoking AGAIN! As expected, my weight went right back down…and I lost a few more pounds. YEA! Well, after about two weeks of enjoying this most recent smoking binge, I set a date to quit smoking AGAIN…on my next “return to work” day. I did just fine for about five days. I quit at the wrong time of the month…the part of the month for me that my weight goes up about 5 pounds…regardless of caloric intake. My Rational Mind knows it’s just water…maybe some extra poop…but, I’m bloated and I have to wear a larger size…and that’s NOT okay. It was also Easter time and my child brought a large bag of some VERY FRESH chocolate covered raisins home and of course, she had to show me what she had. Okay, those were consumed the first night, but I skipped dinner to offset the increased calories. The next day, my friend visits and brings over Easter candy that she found on sale…of course, it’s chocolate stuff…and of course, I consume that…however, because I missed nutrition the night before, I ate real food, too. Okay, we’re doing “the weight done gone crazy” thing again. My Emotional Mind was freakin’ out…so I asked my husband to bring me some smokes on his way home. I told my family and my friend that I would quit smoking AGAIN once my weight was under control and to NOT BRING SWEETS INTO THE HOUSE if they wanted me to stay off smoking. Our recovery has to be a family affair…our support people need to support us and to help keep our environment as temptation free as possible. Very few people will recover if they live in an environment filled with temptation. That’s why we’re told that we have to change people, places, and things. Okay…a few weeks went by and I quit again. I quit for five days and I started smoking again because I was stressed out at work…and just because I wanted to. It wasn’t about weight…it was about MY WANTS. I WANTED to smoke. So, now here we are at Saturday, May 23rd, 2009. I’ve quit AGAIN. I’ve been off cigarettes since Tuesday, May 19th when I went back to work after a long weekend. The week went well, though Tuesday at 4pm when it was getting close to quitting time (at work), I was thinking about the 23 minute drive home and how I could stop off and pick up some smokes…and how nice that would be. I thought about how much I REALLY WANTED a cigarette…and how I was really “Jones-ing” to smoke. Well, that was a defining moment for me…and I said in a strong voice (inside my head)…”I most desire to be a non-smoker.” and…that was it…I sighed deeply, flushed, and went on with my evening. I drove right home and it was wild…while I waited at the Walmart light, it occurred to me that I hadn’t thought about cigarettes until just that moment when I thought about not thinking about cigarettes. That was pretty cool! I’ve done great until today, Saturday…the 23rd as referenced above. I’ve gained three pounds because it’s that time of the month. At the beginning of this most recent non-smoking attempt, Wise Mind suggested that I wouldn’t start freakin’ out until I gained 8 pounds…to give myself a larger window before taking action! I weighed one more pound on Wedn morning, one more on Thurs…and one more on Friday. I was the same weight this morning. That should be exciting because maybe the monthly weight gain is slowing down…and the eating an extra 100-200 calories a day not smoking isn’t adding up too fast. My Emotional Mind was a bit disappointed…because if I would have gained another pound or two, I could have smoked again. I was actually disappointed. I even weighed a second time just to be sure. Aren’t we sick?! I say “we”…because we folks who struggle with recovery do all sorts of things to sabotage ourselves…so we can return to our habits and addictions. Of course, I was Mindful of my mind games and reminded myself that I want MORE to be a non-smoker, save the money, breathe better, it’s more professional, I don’t want to be burdened with the habit and the NEED to smoke when it’s inconvenient and I’m going to be late for a meeting, I’m smoking up my book profits, God’s been good to me and look how I’m taking care of his blessing….etc. I also reminded myself that I told my Group on Wednesday about what helped me to win the relapse battle on Tuesday (what do I desire more)…and how awful it would be…to have to let my Group down by telling them that I’m smoking again. What a horrible example that is. What a hypocrite I would be. I’m encouraging them to change everything in their lives as they try to quit life-encompassing habits like drugs and alcohol…and I can’t overcome smoking. All these Rational Mind thoughts attacked that sick Emotional Mind Game…but, I did think that I could just not smoke in the mornings…that I wouldn’t smell like smoke during Group…and if they asked, I could lie. The faces, the stories, and the hearts of some of my Group Members flashed through my mind…and the guilt trumped my desire to smoke. Today is Saturday and it’s a time when I spend long hours on the computer. It’s a time when I really enjoy smoking…one cigarette after another. It’s a very convenient and relaxing time to smoke. So, today has been tough. I’m glad I have no smokes at home, I’m glad the store is about 10 minutes and a major hassle away…and that I hate leaving my home on my day off…and my husband hasn’t said, “I’m going to the store, want anything?” I did hear my boy ask his Dad if he was going to “Buffalo Fina” after he drove to a friend’s home to feed their horses. Thank goodness, my husband said, “No, I haven’t thought about it.” Thank goodness I didn’t say, “Hey, could you pick me up a pack of smokes.” I’ve had to remind myself so many times today what it is that I really want…and it’s to be a non-smoker. I ate fine today…but a part of me wishes I will have gained an extra pound in the morning. I did pray this time around for God to help me through this. I told him that unlike in the past, I may not be able to do this on my own this time…that it was getting harder. I’m off work tomorrow and Monday…Memorial Day weekend. Lord, keep me focused…keep me Mindful of what my goals are…help me through the rough moments…and help me to be bursting with pride and excitement on Tuesday when my Group asks, “Did ya’ smoke?”…and I can say “Came close…came real close, but worked through the moment…for hours and hours over that long weekend!” See me through this Lord, Amen. This makes me smile and gives me hope that I’ll make it through. I don’t want to be a disappointment to others…I want to be an inspiration. I think I made it through! Got through the long weekend WITHOUT smoking. Had several tough moments each day…really desired to smoke…but used all my Rational Mind – Wise Mind – Talking Myself Through the Moments skills to make it through. Been off cigarettes 8 days now…guess I saved about $40. Almost enough to purchase another pair of boots off Ebay! I’ve probably made it through the toughest point…the long weekend. I bet I can be done with cigarettes…if I choose to be. By the way, my weight is good…have only gained 1 pound during “this time of the month.” I worked harder on my eating this weekend so I wouldn’t have an excuse to start smoking! I was very Mindful of my Mind Games! I made a point of putting up food my family left on the counter so I wouldn’t snack on it all day! I also ate a bunch of sunflower seeds. Sunflower seeds SEEM to reduce my appetite. They’re also good cuz they give my mouth and hands something to do…a fine replacement for cigarettes. You know what else I might try…pomegranate seeds. They make for quite a bit of hand and mouth work!!! I haven’t eaten those since I was a kid! Oh Lord, I cannot cycle back to fond memories as a kid and smoking! Man, our Emotional Mind is relentless! Gettin’ Started – An Awkward Moment! Not being an experienced blogger, this seems quite awkward. However, I’m doing it anyway. I have just published a DBT-CBT Therapy Workbook and everyone tells me I have to do a blog! As might be expected, I am a clinical psychologist. I work for the State of Texas at Big Spring State Hospital. I’ve just celebrated my 20th year with the State. That means I’m not a spring chicken anymore…but it also means I have 15 hours of vacation time per month (yea!) and I’ll be retiring…in 8 years! That probably seems like a VERY long time for younger folks, but for the older folks, it’ll fly by! Time really seems to go by faster the older we get…maybe that’s just because we don’t remember so much about everything that happened in between the years! I thought I would write about the new understandings my patients teach me…and the new understandings I come to by working with them. I also thought about sharing some of my own struggles and experiences to show that we’re all human…that we all struggle with our humanity. We all have emotional issues and concerns…and the task we have in life is to work hard to deal with ourselves…and to do the best we can to be okay…and to help others along the way!